This was so weird and I really can't explain it. Things have been a little tense at home this last week and a lot has been going on in terms of really bad things happening to very special people in my life. Last night I went to bed alone and was awoken by someone shaking my foot, I was sleeping on my stomach. I awoke immediately thinking there was an intruder in the house. My natural instinct was to make as if I am sleeping and again someone shook my foot as if trying to wake me gently. I wanted to scream for my husband but thought that this would be a dangerous move. The next moment someone lay down half on top of me. It was as if there wasn't enough space next to me so they lay half on top of me, flinging their arm across me but causing me to expel my breath with an audible groan. With the weight on top of me I started feeling terribly claustrophobic and really struggled to get out from under it. The moment I was free I sat up and looked around, there was nobody there. I also noticed that my husband had come to bed and was sleeping soundly. I stood up, checked the house, went to the bathroom and then back to bed. I feel that this entity was there to comfort me and in no way intended to harm me. Besides my fear when I thought it was an intruder, I was calm. But, I have no idea who this was. I must also mention that I was awoken from a dream about my sisters being injured in hospital. Whether this caused the visitation I have no idea. I live in South Africa and burglary and murder is an everyday occurrence, thus my initial reaction that it may be an intruder. If anyone can help me understand this, I would be extremely grateful. The following comments are submitted by users of this site and are not official positions by yourghoststories.com. Please read our guidelines and the previous posts before posting. The author, annie16, has the following expectation about your feedback: I will participate in the discussion and I need help with what I have experienced. Snap, both my aunt and I have experienced the same thing, minus the tapping of the foot. I was sleeping alone, facing the wall, when I felt someone hug me from behind. My sliding door makes a noise when you open it (I don't know how, but my little cousin broke it so it comes off the track when opened real fast & all the men in my family have BEEN fixing it for a year now?😵), and I always lock my other door before going to bed, so on realizing that I didn't hear it open, I sat up only to find nothing and no one there with me. I don't like spirits that scare me or come from behind so I cr***ed on whatever it was and tried falling back to sleep again. One thing I must say though, is although the move itself could be seen as "comforting", the feeling I got was anything but- maybe it was the adrenalin and being on high alert #shrugs but I remember my aunt also feeling unsettled by hers. Would also love to heat from others if they know what this is and why it does that. I've experienced it twice already, the above being the most recent. Hi Melda. It was as if I needed to be awake for some reason almost as if it WANTED me to know it was there. 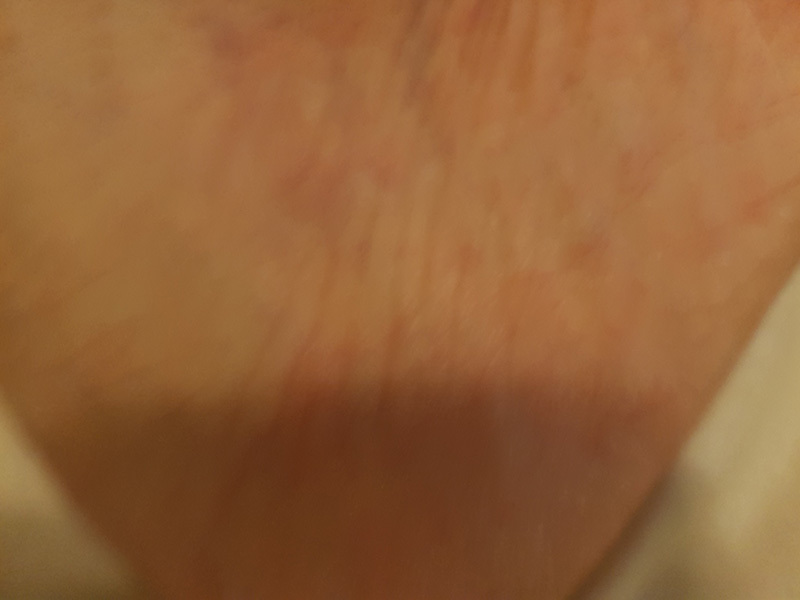 I spoke to my brother about it and he said it might be my mother. However, I don't think so. For one, we never got along and two, my mom was very slim while this entity was really heavy. Hi Twilight, yeah, murders, burglaries and rapes occur daily. In fact a close friend's husband was recently shot in their home. I don't think there is one person in SA that can't tell you about an occurrence to someone in their circle of friends. Nevertheless, My husband must have come to bed before this happened as he was fast asleep so yes, that means he was laying beside me when I felt the spirit lay on me. No other experiences have happened recently. My encounters are usually very far apart. Someone did suggest it might me my home that is haunted, but I don't think so. If this was the case, I would have felt something a long time ago. Thanks both for the feedback. I do appreciate it. Greetings Annie, that's really scary to hear that having someone break into your home, as well as having murders happening where you stay, is so frequent around there 😨 I really feel horrible for ya'll to have to worry about things like that happening to ya'll 😳 I'm glad that this was not the case here, but from what you said, it makes me think that whoever was shaking your foot that night, was trying to get your attention for some reason. It's odd that after shaking your foot, it then proceeded to get in bed with you, and partially lay on top of you, throwing its arm over you to the point of knocking the breath out of you 😕 that seems a bit extreme to me. I don't understand why it chose to do that, after what seemed to be it trying to get your attention. You said when you finally was able to get up, and look around, that you saw that your husband had already came to bed. Does that mean he was laying beside you when you felt the spirit lay on you? I ask because you mentioned how it felt the way it laid beside you, was as if it didn't have much room, making it lay partially on top of you. So I'd assume if your husband was in bed at that point, that's why the spirit laid on you the way it did. But even so, it's still very odd to me that it laid on you the way it did, throwing its arm over you. Like it was making itself comfortable in bed with you. Has there been any other things happening lately that are odd? I'm curious as to the reason of this experience as well, but agree that it doesn't seem to be a bad spirit, maybe a bit annoying lol but not bad. Well thank you for sharing your experience, and I hope to hear back from you. annie - That must have been a really frightening experience. I too am South African so I understand that your first thoughts were that this was a human up to no good. I had an experience where I saw somebody in my bedroom and I did exactly what you did, pretended that I was asleep. My husband was away on a business trip at the time. I can't even begin to explain what a relief it was when I realised that what I was seeing was a ghost. His face was a picture of concern when he realised that I had seen him and I let him have it for scaring the living daylights out of me. I wonder why your visitor acted in the way you described? I also wonder whether you would have seen him/her if you had looked up when your foot was being shaken. Possibly it was somebody trying to comfort you but why choose such a strange way to do so? Hopefully some of the readers can be more helpful. 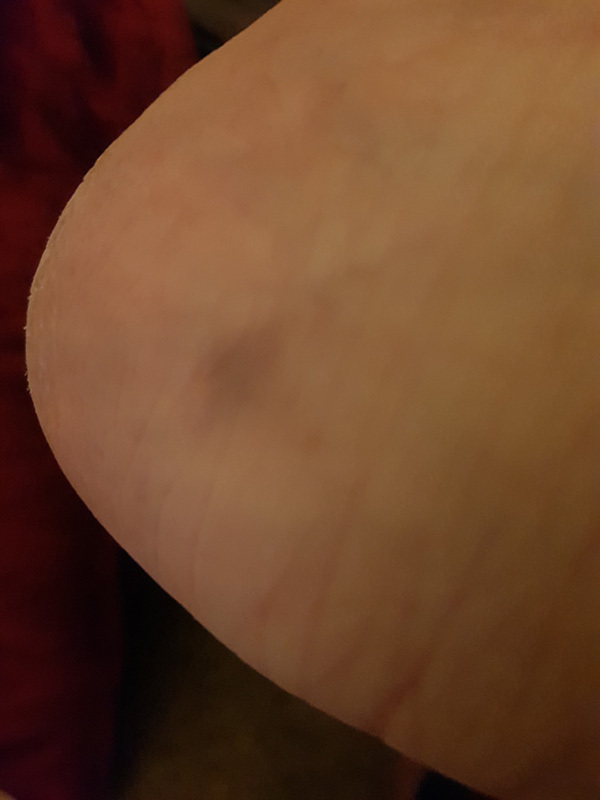 The photos posted are bruises on my foot where I felt the visitor hold and shake it. © The ghost story A Visitor Last Night is copyrighted to annie16. Edited by yourghoststories.com.